While Irishmen and the landlubbers are staying at home with you. While we, like jovial hearts of oak, stand many a bitter squall. You’d shun to meet those landlubbers that lounge about the shore. And all about does danger lurk, the vessel may go down! To shorten sail to weather the gale until we reach the land. And when our cash is getting low, we ship again for more! This month’s song comes from a blend of sources. 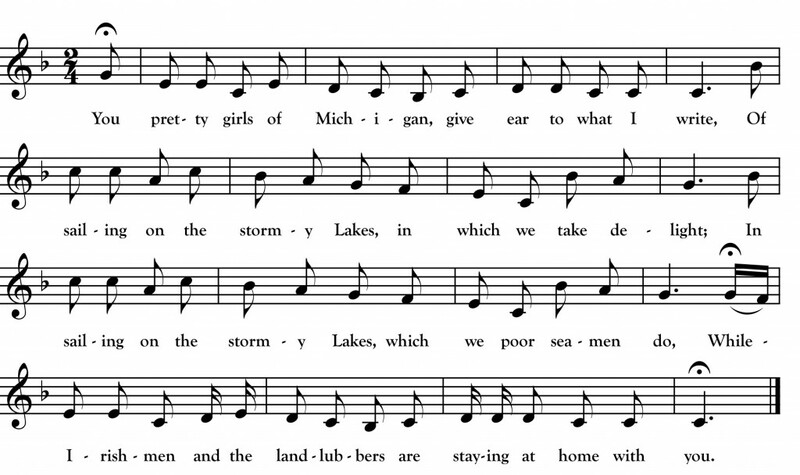 The prolific collector of Great Lakes folksong Ivan Walton put down the above text based on versions gathered from Pat Banner of St. Clair, Michigan, and Captain A.E. Baker of Dunkirk, New York in 1933. Walton’s composite text is published in the wonderful book Windjammers (Walton, Ivan and Joe Grimm. 2002. Detroit: Wayne State University Press) which I would strongly recommend to anyone interested in songs of the Great Lakes. Walton did not collect a melody for this song. A closely related song, “Ye Maidens of Ontario,” was collected in Bemidji, Minnesota in 1923 by collector Franz Rickaby from the singing of Albert Hannah. Above, I have married the words collected by Walton to the melody sung by Hannah. Normally, as a proud Minnesotan, I would stick to the words also collected in Minnesota but, in this case, it is the Michigan/New York text that contains a rare reference to a Minnesota place name: Duluth. Of course, Duluth was (and is) Minnesota’s gateway city to the Great Lakes and, as the phrase “Duluth to Buffalo” implies, it was the end of the line for these rough and tough freshwater sailors. The pairing of “Irishmen and landlubbers” in the first verse is interesting. Irishmen certainly sailed the Lakes themselves and Irish names appear in other Great Lakes ballads (see N.S. Apr. 2014).